Come up with firm dates for your trip. Use climate data, airline prices and hotels to decide on a suitable time for your trip. Read up on the visa requirements from the Chinese Embassy, and contact the embassy with any problems you discover. Check whether your passport is current (more than 6 months prior to departure), and renew it if necessary. If you want to take advantage of early bird airline discounts, familiarize yourself with the options for cancellation and/or rescheduling, since travel insurance doesn’t cover the risk of the visa not being granted. 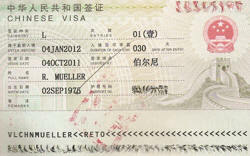 On the other hand, it is necessary to book the flight and hotel stay before the visa is granted. Follow up with your visa. The least expensive type of tourist visa is valid for a trip ending within 3 months, and for a slightly higher price one can obtain a visa that is valid for multiple entries within 6 months. Since one must first have obtained flight and hotel bookings to be granted a visa, there is a certain risk that the visa might not be granted in time, a situation that is not covered by travel insurance. If you do last-minute booking of your flight and hotel, you can get expedited processing of your visa - even the same day as the application - for a surcharge. This option is recommended if the Chinese embassy or consulate is located far away from your home. Check your first aid kit, especially to make sure your have medication for diarrhea, vomiting and fever, and a thermometer. Take only the medications you really need, in their original packaging with the package insert, and only in quantities appropriate for your stay. If you need to take a specific medication, make sure to bring a letter from your doctor in English stating that you must take that medicine. Take along ear plugs for the nighttime, because the traffic noise in the city can get pretty loud. 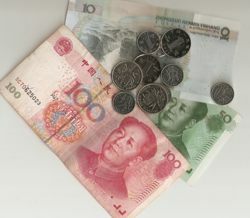 Ask at your bank or check the internet for current exchange rates for the Chinese yuan (renminbi). Decide for yourself whether or not it is cheaper to exchange currency after reaching China. Prepare a realistic budget, and bring sufficient dollars or yuan with you to Shanghai.